The second quarter of the year, and the 2015 Finish-Along, proved to be a bit of a bust for me. For those of you that haven’t followed along, the 2015 Finish-Along is a year-long, linky party, where each participant works to complete as many projects as possible. I’d had plans to finish two more projects that have been waiting a while, but I’m now working six days a week. I’m still figuring out how to balance having a life, sewing, and managing a household. I *could* work two eleven hour shifts per week, to get back to only working five days a week. Honestly, though, I’m not sure that I want to. Especially since I’m sure that my hours will only increase more as we move toward the holiday season. Seriously, I have to think about this. I work in retail. I have to be holiday ready in four months, and will be constantly flexing my store to accommodate my stock levels as merchandise moves. I can’t wait to share the other project I finished. I can tell you it’s a baby quilt, and that I’m going to be sending it to a friend in Minnesota who just had her first baby. I attempted free-motion quilting on my new machine. I’m… okay with the efforts, but want to improve my technique. I’m not sure it’s possible, as I have this huge mental disconnect with FMQ. 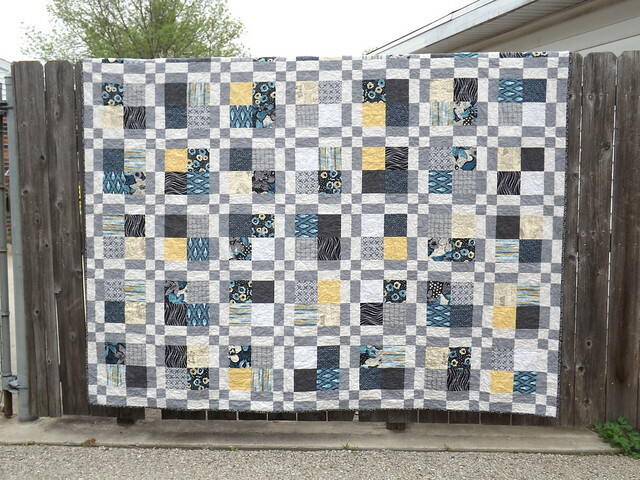 I have, however, purchased two Craftsy courses on FMQ, to try to leap over this hump. In addition to these two quilts, I’ve kept up with my Traveling Bee-utiful obligations. Last month’s farm quilt was fun, but I’ve been looking forward to this month’s arrival for a while. It still hasn’t shown up, and, with the 4th of July, now will not arrive until early next week at the earliest. I’m still excited. I can’t wait to work on this one. It’s not in my usual colors, so it’ll push me out of my comfort zone a little. Photos when I get it, I promise.